curl | sh : People telling people to execute arbitrary code over the network. What harm can it do ? Nuwa : Huawei micro-server with disaggregated architecture based on commercial chips, and the computing and storage nodes can be switched on demand. Mikelangelo : EU project with some interesting bit of technology and consortium Member : Huawei, Cloudius (for OSv). 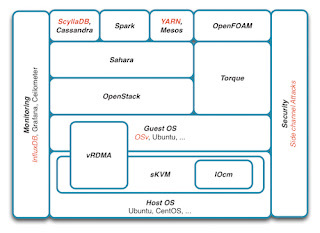 Note the vRDMA concept where they aim to use shared memory approach over RDMA to speed up communication across VM.